And to think this sort of thing is happening in the back of Teacup. When I heard the sainted Mary Ellen McTague was opening a pop up here while her Prestwich restaurant, Aumbry, was being renovated, I wasn’t sure how it would work. The answer is: fine. It doesn’t feel much like the back of Teacup, though you can see people in the cafe. The lighting from the open kitchen shines out like floodlights – but some German botanical prints and an antique dresser have been employed to good effect. 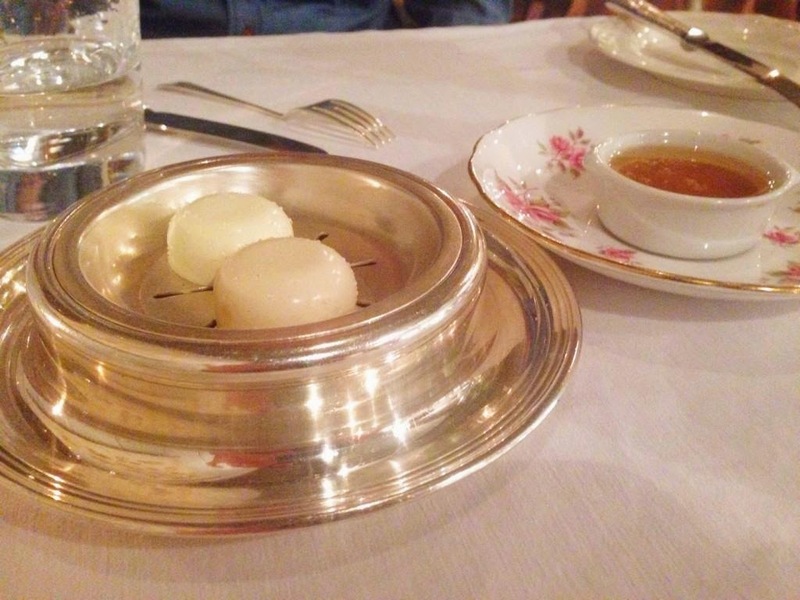 As at Aumbry, the china and silver are old fashioned and mismatched, and the big, nubbly linen napkins look like the sort of thing a Victorian housewife might have done the washing up with. They probably cost about £45 each, but they’re intensely covetable. 4244 is serving a single menu, four courses for £50 with wine on top (pairings at £36). Eccentricities abound: The wine list is all Croatian as they genuinely love the wines and want to showcase small producers from the country. I’m on board with that as long as they’re all as good as the big, powerful Cattunar Teran, which knocked us sideways like a fist swathed in silk. They make their own bread from biodynamic flour – yep, grown according to the phases of the moon – no idea if this makes any difference, but it’s the chewy, rustic stuff I love. And there’s that butter (made in Bolton). And the dripping. Ah, the dripping. The food is exactly what you'd get at Aumbry, but no need to do anything new as this is a different audience. A frankly ridiculous number of good amuses was followed by wild mushrooms with curds, hay ash and birch powder. The textures were punched up with crispy, soft rounds of homemade malt loaf – but the taste balance was edgy. McTague likes bold, at times downright peculiar taste combinations and I love eating food like this, but it’s dangerous cooking. With this many powerful flavours shouting at once the result is not always completely harmonious. I don't mind that, though. It's the opposite of comfort food, and I mean that as a compliment. Hare consommé reminded me a lot of a dish I’d had at The French, which I’d argue is the only place in town serving better food than this right now: cubes of barely cooked turnip, daringly rare rabbit and a rich, tepid broth poured from a wee teapot. But the star of the night was a slow cooked partridge pie of unsurpassing loveliness. Again, the textures were so beautifully balanced, and here the taste combinations were spot on, with the mellow shards of savoy cabbage, flaky homemade pastry, cooked-to-meltingness meat and the sweet pan reduction mingling with the celeriac cream. Ratafia pudding is one of those 18th Century dishes of the sort that McTague likes to ferret out of her vintage cookbooks. Given the choice, I’d never order it. Thankfully, I didn’t have a choice. A cube of Cox’s Pippin, clear red and baked until buttery perched on a slab of sweet pastry, like a deconstructed Tarte Tatin with a dash of intensely cidery sauce. My Cattunar Muskat Ruza was pleasantly dry and green for a dessert wine, though I wished I’d gone back and ordered another glass of that glorious red instead. Next time. For I’m going to be saving up to get back there again before 4244’s six week run is over. Greedy? Maybe. But when it comes to this woman’s cooking I have very little self control.